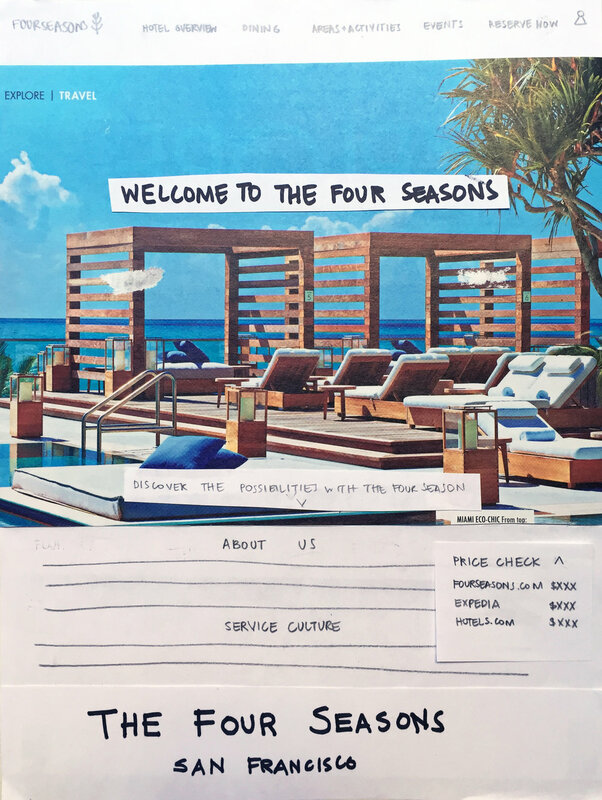 Five Star Hotel's have noticed that 3rd-party services are capitalizing on discounted rates for rooms and would like to compete with them. For this group project, I partnered with two UX designers to collect and synthesize data to address user needs. I led our team through design strategy and focused on research and visuals throughout. Everyone can receive an upgrade or discount if they book directly on a hotel site. So why don't people instinctually book directly with a hotel instead of third-party sites? I started with a competitive analysis to understand our competitors and see where luxury hotels are lacking. After the competitive analysis, we interviewed loyal guests and learned what they love about the hotel no matter where they are in the world. "YOU KNOW YOU'RE GOING TO HAVE A GOOD EXPERIENCE... IT'S A LUXURY HOTEL." With all of the research that was collected, we synthesized the information and created a persona that will guide us to designing for a large majority of users. Through design studio, I had an idea of creating wristbands that users can use to access hotel amenities and plan as they go. But through user research, I learned that users want to plan and pay for their trip beforehand. Our following assumption is that users would book directly with hotels if they knew what amenities they would receive. So in order to keep the integrity and class of hotel standards, we created three tiers [Gold, Silver and Platinum] packages in order to attract guests and inform them of perks that are offered when booking directly. I built paper prototypes with the packages of amenities that would be offered to guests. After doodling on paper, I started cutting out photos to depict the luxury brand.